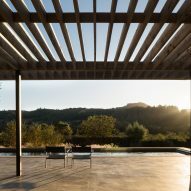 American studio Ro Rockett Design has added a weathered timber pool house to a hilltop retreat in California's Sonoma County, for residents to enjoy vineyard and coastal vistas while relaxing. 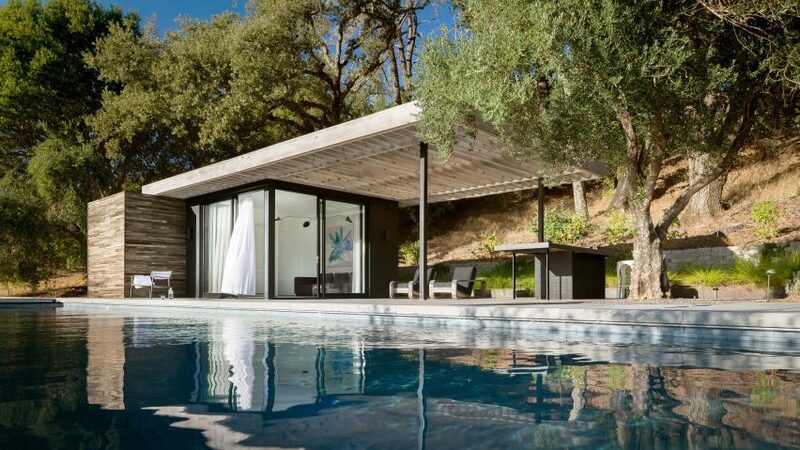 Ro Rockett Design built the Dry Creek Pool House to accompany a narrow holiday home located near the town of Geyserville, in northern California. The owners were eager to find ways to improve the property with new amenities. A slender pool is raised slightly above the slope on a plinth, in order to hide the nearby road from people using the deck. The elevated position is also intended to focus views towards the "rolling vineyards and classic coastal California ridgelines beyond". 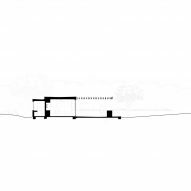 "Nestled into the hill with its back to the trees, the new, earthen ground plane acts as a primitive plinth that supports a rustic enclosure," said Ro Rockett Design in a project description. 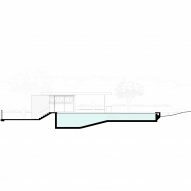 Dry Creek Pool House comprises two volumes. 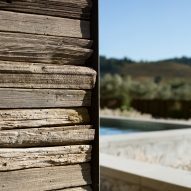 Roughly weathered timber sourced from grape stakes on the site clads one of the structures, making a reference to the wineries that populate Sonoma County. 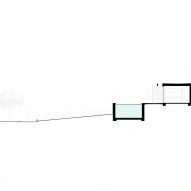 The other is a black pavilion with large panes of glass. "This cladding provides solid walls where necessary and opens to the view where desirable," said Ro Rockett. The inside features sofa, a bathroom with shower and a mini-bar. Stark white curtains run along the windows and can be drawn to provide privacy or shade from the intense sunlight. A slatted canopy covers a portion of the outdoor deck, which runs alongside the pool. It shades an outdoor dining table and bar, alongside two separate lounge areas. As part of the project, Ro Rockett also added a bocce court just down hill from the pool and adjacent residence. Despite being closer to the road, this area is protected from prying eyes by a row of trees. Other new amenities include a new guest arrival area and car park. According to Ro Rockett, the clients were so pleased with the new configuration of their vacation property that they decided to move there permanently. 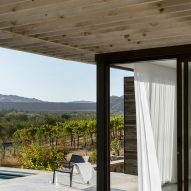 "Conceived as a rustic retreat for a couple of city dwellers, the property quickly became a full-time respite that lives and breathes the Sonoma County lifestyle," the studio said. 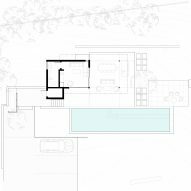 Other pool houses added to American residences include a slatted wooden structure designed by Michael Goorevich for a Malibu house, and a pool-side pavilion in East Texas that Murray Legge Architecture shaped around tree trunks. Photography is by Adam Rouse.